According to the Iranian paper Etemad Melli, the Iranian government has increased its blocking of Web sites, particularly foreign news sites. It appears that as the Iranian election campaign gets into gear that the government has begun to crack down on opposition Web sites, as well as Persian language sites of Western news outlets. The Jerusalem Post reports that the Persian sites of Radio France Internationale (RFI) and Germany’s Deutsche Welle radio have been blocked. Deutsche Welle is one of the few foreign news organizations that is allowed to have a full-time foreign journalist based in Iran. And the BBC Persian Service, one of the most heavily trafficked Western media sites in Iran, was recently declared illegal and a threat to national security. In December, Iran also announced that it would move to ‘deal harshly’ with ‘immoral’ Web sites. This led to fines and the closure of a leading dating site in Iran, Hamsarchat. A number of bloggers have been arrested recently, including one of Iran’s first bloggers, Hossein ‘Hoder’ Derekhshan, who was detained, technically, for his travels and writing about Israel, but also may be charged with insulting religious figures. He reportedly could be put to death if convicted. And according to RFE/RL, Esmail Jafari, a blogger from the southwestern city of Bushehr, was sentenced to five months in prison for anti-government publicity and disseminating information abroad. While the arrest and prosecution of bloggers is most definitely real, the claim by the Iranian government that it is blocking 5 million websites is almost certainly overblown. 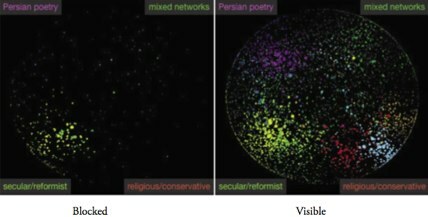 As we showed in our paper, with OpenNet Initiative data, only a fraction of the Iranian blogosphere is blocked, and the Iranian government likely hopes that its talk about pervasive filtering will lead to self-censorship by bloggers. A number of circumvention tools also make it much easier for Iranians to get around blocked sites, further undermining the attempts by the government to filter the Internet.